When you are looking for Police challenge coins for your organization — why not choose the nation’s highest rated challenge coin company? Opened in 1993, Celebrate Excellence is now the nation’s highest rated challenge coin company — the only national coin company with an A+ rating from the Better Business Bureau; more Google 5 star ratings than any other challenge coin business and an All A rating from Angie’s List. And we have over 270 on-line testimonials from our customers! 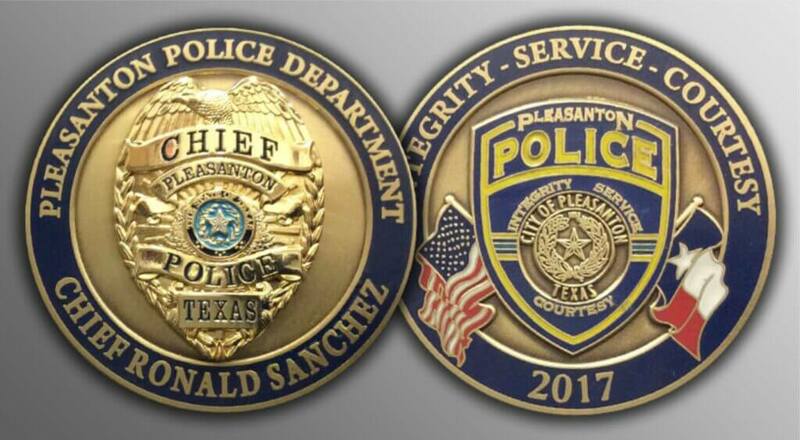 Police and Law Enforcement agencies nationwide have depended on Celebrate Excellence to create unique and high-quality custom coins for years. While we have an internet presence — we are more than simply an internet coin company. We have a 1700 sq foot showroom and coin design center in San Antonio, Texas. For our Texas agencies, we are HUB certified by the state as a Veteran-owned business. Police challenge coins are the perfect memento to mark your service and dedication to your community. Used as recognition, mementos of your service, commemorative pieces for your family — nothing compares to a law enforcement challenge coin. And Celebrate Excellence is honored to have helped units, agencies and police departments around the nation. We would be honored to help you, too! We can provide you with a free quote for your coins. Or call us at 1-800-662-8283 and ask for a Law Enforcement specialist.